Wait a minute. Why the different apps? And how do we manage the received URL? What happens if more than one app has the same URL type defined? How can I use user metrics in my application? How do user metrics work? 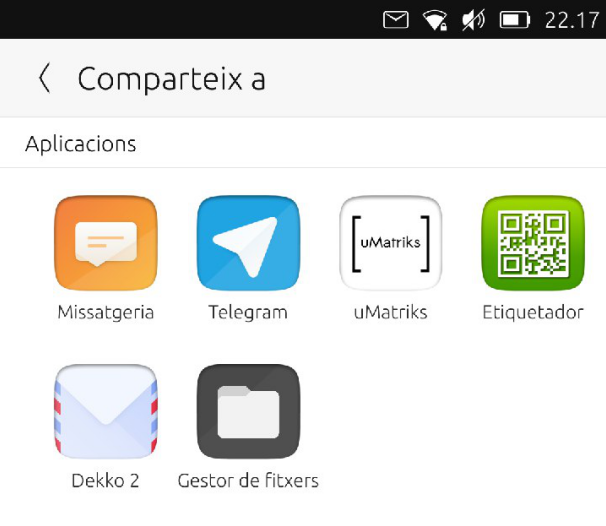 On Ubuntu Touch the apps are confined. The way of sharing files between them is through the Content Hub, a part of the system that takes care of file import, export and sharing. ContentPeerPicker is the element that shows the apps. contentType is passed in Main.qml as ContentType.Pictures. So, we will only see apps from which we only can import images. handler is passed in the same line as ContentHandler.Source. As we want to import an image from the app selected in the Content Hub. In Gelek, we are going to end with some saved games that we want to save in our device or share with ourselves (in Telegram and then save them to our computer). Tapping on the download icon we will get a Content Hub to save the game file (which is actually an export). The game file is a file of type glksave. We will tell Content Hub that we are sending a file of type All (see the Install Page code). contentType is ContentType.All, so we will only see apps which are able to receive unmarked file types. handler is ContentHandler.Destination, so the app selected should store the saved game. Tapping on the File Manager we will save the saved game in the folder we choose. Similarly, tapping on the share icon will allow us to send the saved game through Telegram to ourselves (see the Webapp Creator Import Page source code). Each developer can decide the rules each app would follow in relation to the Content Hub. Why the OpenStore is shown as the destination of an export? This means, the OpenStore will be the destination for all ContentTypes. So, with this example, uMatriks will be able to be the destination, source and share app for all kinds of ContentType. What about the other hooks in the manifest.json? That is discussed in the next guide. © Copyright 2019, The UBports project (Creative Commons BY-SA 4.0) Revision 47a2ffe0.